This is my 100th recipe. 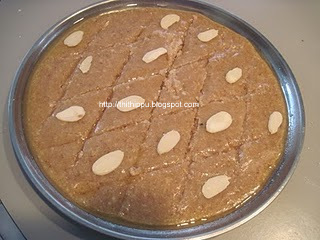 So I want to write a sweet recipe even though I have a sweet recipe blog www.thithippu.blogspot.com. This is very easy to prepare. Powder coarsely all the nuts in food processor. Roast the mixture in low flame for about 5 to 8 minutes. Remove and keep it in a bowl. Add the hot syrup into the bowl with cardamom powder and mix well till it becomes soft. Spread it into a greased plate and cut into pieces. This is unique and healthy chutney. My mother used to make this chutney. Pumpkin seeds are very good for health. Remove the skin of the Mathan(yellow pumpkin) and take only inside pulp with seeds. Then add the pulp and fry 5more minutes then grind with tamarind,salt,asafoetida into coarse paste. 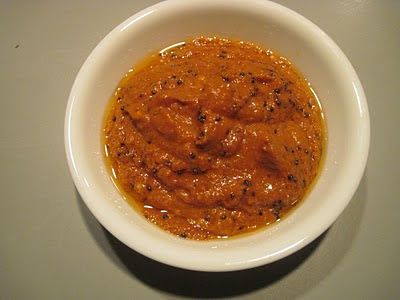 It is very tasty chutney and serve with hot rice. Powder the peanuts. Chop the dates and fry them in ghee till it becomes soft. Add jaggery into the mixture and stir continuously. Add peanut powder and sesame seeds. Mix well. When it becomes thick, remove it in a plate to cool down. Apply ghee on your hands and make small ladus. Mix all the ingredients for kofta and make a dough to fry. Heat a pan with oil and drop small ball of dough into the hot oil . Fry the koftas.till they become golden brown..
Heat a pan with oil add cumin seeds, When it fried add besan, for 2minutes. Add the tomato puree,turmeric powder,chili powder,coriander powder and asfoetida. Cook at medium flame until the tomato mixture starts leaving the oil. Cut one onion into small pieces. and other onion into big pieces. Heat a pan with oil add cardamom, cinnamon,clove and cashews . Fry a little and then add the big pieces of onion, garlic and ginger and keep to cool. Add coconut, kuskus and grind into paste. Cut all the vegetable into small pieces. Heat a pan with oil add vegetables, salt and the ground mixture.cook them. If the gravy is thick add little water. Wash and cut the cauliflower into big pieces and boil it in water with the peas..
Heat a pan with oil add cinnamon, cloves and aniseed. Add the ground masala and fry it in a low flame till oil separates from it.. Mix the boiled vegetables, salt, turmeric powder and little water. When the gravy becomes thick add tomato puree and mix well. 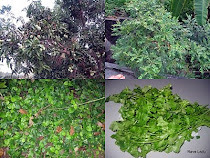 Garnish with coriander leaves or curry leaves. Serve with chapathi /rice. Remove the skin of cucumbers and cut pieces. Remove the pulp of avocado. Put all in a blender and make smooth paste. 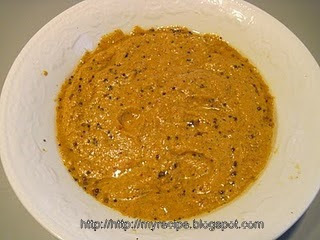 Remove in a serving bowl and decorate with red pepper pieces, and coriander leaves.